One in four Rega Record Store Day turntables contain special prize | What Hi-Fi? 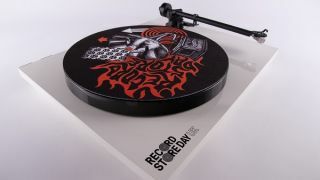 Of the 500 Rega P1-Plus RSD 2019 decks on sale on Record Store Day (13th April), 125 – a quarter of them, then – will contain a special prize inside. The gifts (pictured below) include record tokens worth £25, signed posters by the likes of Ian Brown, Fun Lovin Criminals, Orbital, Brett Anderson and Hank Marvin, and signed records by Tom Walker, Sundara Karma and KT Tunstall. The grand giveaway is two tickets to the 2019 Mercury Music Prize awards. Rega says the prize-toting decks will be distributed at random to shops around the UK.